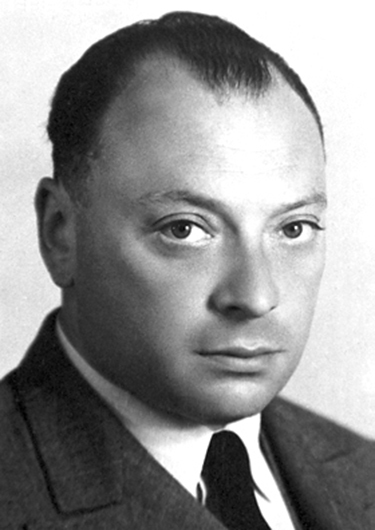 In 1925, the Austrian physicist Wolfgang Pauli (see Figure 1) proposed the following rule: No two electrons can have the same set of quantum numbers. That is, no two electrons can be in the same state. This statement is known as the Pauli exclusion principle, because it excludes electrons from being in the same state. The Pauli exclusion principle is extremely powerful and very broadly applicable. 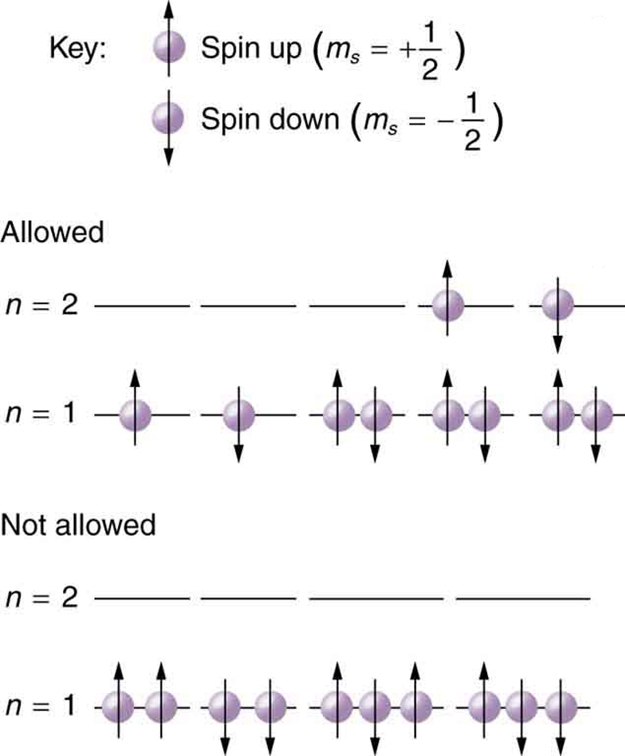 It applies to any identical particles with half-integral intrinsic spin—that is, having . Thus no two electrons can have the same set of quantum numbers. Let us examine how the exclusion principle applies to electrons in atoms. The quantum numbers involved were defined in Chapter 30.8 Quantum Numbers and Rules as , , , , and . Since is always for electrons, it is redundant to list , and so we omit it and specify the state of an electron by a set of four numbers , , , . For example, the quantum numbers completely specify the state of an electron in an atom. Since no two electrons can have the same set of quantum numbers, there are limits to how many of them can be in the same energy state. Note that determines the energy state in the absence of a magnetic field. So we first choose , and then we see how many electrons can be in this energy state or energy level. Consider the level, for example. The only value can have is 0 (see Chapter 30.8 Table 1 for a list of possible values once is known), and thus can only be 0. The spin projection can be either or , and so there can be two electrons in the state. One has quantum numbers , and the other has . Figure 2 illustrates that there can be one or two electrons having , but not three. Because of the Pauli exclusion principle, only hydrogen and helium can have all of their electrons in the state. Lithium (see the periodic table) has three electrons, and so one must be in the level. This leads to the concept of shells and shell filling. As we progress up in the number of electrons, we go from hydrogen to helium, lithium, beryllium, boron, and so on, and we see that there are limits to the number of electrons for each value of . Higher values of the shell correspond to higher energies, and they can allow more electrons because of the various combinations of , , and that are possible. Each value of the principal quantum number thus corresponds to an atomic shell into which a limited number of electrons can go. Shells and the number of electrons in them determine the physical and chemical properties of atoms, since it is the outermost electrons that interact most with anything outside the atom. To denote shells and subshells, we write with a number for and a letter for . For example, an electron in the state must have , and it is denoted as a electron. Two electrons in the n=1 state is denoted as . Another example is an electron in the state with , written as . The case of three electrons with these quantum numbers is written . This notation, called spectroscopic notation, is generalized as shown in Figure 3. Example 1: How Many Electrons Can Be in This Shell? The number of electrons that can be in a subshell depends entirely on the value of . Once is known, there are a fixed number of values of , each of which can have two values for . First, since goes from to l in steps of 1, there are possibilities. This number is multiplied by 2, since each electron can be spin up or spin down. Thus the maximum number of electrons that can be in a subshell is . For example, the subshell in Example 1 has a maximum of 2 electrons in it, since for this subshell. Similarly, the subshell has a maximum of 6 electrons, since . For a shell, the maximum number is the sum of what can fit in the subshells. 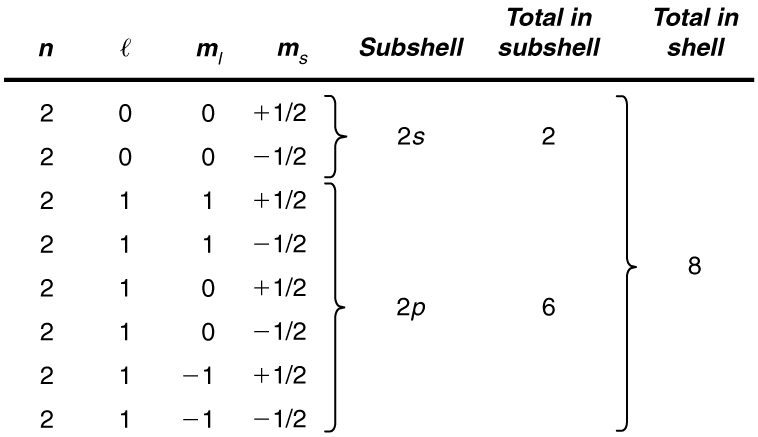 Some algebra shows that the maximum number of electrons that can be in a shell is . For example, for the first shell , and so . We have already seen that only two electrons can be in the shell. Similarly, for the second shell, , and so . As found in Example 1, the total number of electrons in the shell is 8. Table 3 shows electron configurations for the first 20 elements in the periodic table, starting with hydrogen and its single electron and ending with calcium. The Pauli exclusion principle determines the maximum number of electrons allowed in each shell and subshell. But the order in which the shells and subshells are filled is complicated because of the large numbers of interactions between electrons. Examining the above table, you can see that as the number of electrons in an atom increases from 1 in hydrogen to 2 in helium and so on, the lowest-energy shell gets filled first—that is, the shell fills first, and then the shell begins to fill. Within a shell, the subshells fill starting with the lowest , or with the subshell, then the , and so on, usually until all subshells are filled. The first exception to this occurs for potassium, where the subshell begins to fill before any electrons go into the subshell. The next exception is not shown in Table 3; it occurs for rubidium, where the subshell starts to fill before the subshell. The reason for these exceptions is that electrons have probability clouds that penetrate closer to the nucleus and, thus, are more tightly bound (lower in energy). 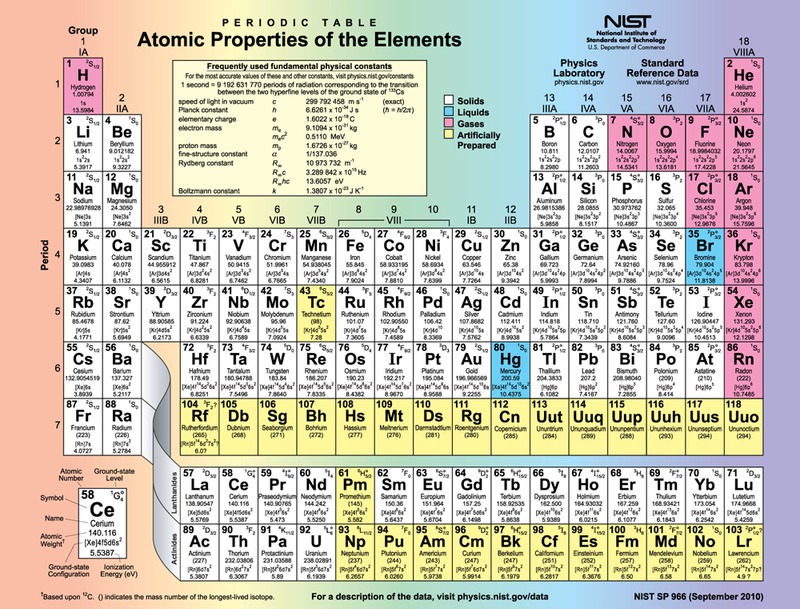 Figure 5 shows the periodic table of the elements, through element 118. Of special interest are elements in the main groups, namely, those in the columns numbered 1, 2, 13, 14, 15, 16, 17, and 18. Group 17 (Group VII) contains the halogens, such as fluorine, chlorine, iodine and bromine, each of which has one less electron than a neighboring noble gas. Each halogen has 5 electrons (a configuration), while the subshell can hold 6 electrons. This means the halogens have one vacancy in their outermost subshell. They thus readily accept an extra electron (it becomes tightly bound, closing the shell as in noble gases) and are highly reactive chemically. The halogens are also likely to form singly negative ions, such as , fitting an extra electron into the vacancy in the outer subshell. In contrast, alkali metals, such as sodium and potassium, all have a single electron in their outermost subshell (an configuration) and are members of Group 1 (Group I). These elements easily give up their extra electron and are thus highly reactive chemically. As you might expect, they also tend to form singly positive ions, such as , by losing their loosely bound outermost electron. They are metals (conductors), because the loosely bound outer electron can move freely. 1: Identify the shell, subshell, and number of electrons for the following: (a) . (b) . (c) . (d) . 1: (a) How many electrons can be in the shell? 2: (a) What is the minimum value of 1 for a subshell that has 11 electrons in it? (b) If this subshell is in the shell, what is the spectroscopic notation for this atom? 3: (a) If one subshell of an atom has 9 electrons in it, what is the minimum value of ? (b) What is the spectroscopic notation for this atom, if this subshell is part of the shell? 4: (a) List all possible sets of quantum numbers for the shell, and determine the number of electrons that can be in the shell and each of its subshells. 5: Which of the following spectroscopic notations are not allowed? (a) (b) (c) (d) (e) . State which rule is violated for each that is not allowed. 7: (a) Using the Pauli exclusion principle and the rules relating the allowed values of the quantum numbers , prove that the maximum number of electrons in a subshell is . 10: (a) What is the distance between the slits of a diffraction grating that produces a first-order maximum for the first Balmer line at an angle of ? A galaxy moving away from the earth has a speed of . What wavelength do we observe for an to transition for hydrogen in that galaxy? In a Millikan oil-drop experiment using a setup like that in Chapter 30.2 Figure 6, a 500-V potential difference is applied to plates separated by 2.50 cm. (a) What is the mass of an oil drop having two extra electrons that is suspended motionless by the field between the plates? (b) What is the diameter of the drop, assuming it is a sphere with the density of olive oil? In a laboratory experiment designed to duplicate Thomson’s determination of , a beam of electrons having a velocity of enters a magnetic field. The beam moves perpendicular to the field in a path having a 6.80-cm radius of curvature. Determine qe/meqe/me from these observations, and compare the result with the known value. Calculate the minimum amount of energy in joules needed to create a population inversion in a helium-neon laser containing moles of neon. 1 It is unusual to deal with subshells having ll greater than 6, but when encountered, they continue to be labeled in alphabetical order. 1: (a) 32. (b) 2 in s, 6 in p, 10 in d, and 14 in , for a total of 32. 7: (a) The number of different values of is Also an overall factor of 2 since each can have equal to either or . to see that the expression in the box is , imagine taking from the last term and adding it to first term from penultimate term and add to the second term . 9: The electric force on the electron is up (toward the positively charged plate). The magnetic force is down (by the RHR). 30.9 The Pauli Exclusion Principle by OpenStax is licensed under a Creative Commons Attribution 4.0 International License, except where otherwise noted.